Since a field trip to Gunong Mulu (altitude 2,378 in), one of the highest mountains in Bomeo lsland, in June and July, 1961, I have become interested in the coniferous genus Phyllocladus. For a long period, my knowledge on this group of plants was limited to a single Malesian species, P. hypophyllus Hook. f. I was extremely puzzled by the complicated nature of its foliate organs, and for years I could not find out a plausible explanation to this. One day in 1970 while lecturing to students on Dr. C.B. Beck's work on Progymnosperms, suddenly it occurred to me that there appeared to have existed some similarities between the foliate organs of Phyllocladus and those of Archaeopteris, though they were described respectively under different terminologies by plant morphologists on the one hand, and by palaeobotanists on the other. In 1976, from April to August, I visited Tasmania (of Australia) and New Zealand and had the opportunity to observe three species of Phyllocladus in their native habitats and under cultivation, and examined a large number of herbarium specimens and preserved materials. As a result, I further elaborated the theoretical conclusions reached earlier. 1. Phyllocladus hypophyllus Hook. f. in Gard. Bull. Singapere 20: 123-126. 1963. 2. Aspects of morphology of Phyllocladus hypophyllus in Ann. Bot. n.s. 27: 69-80. 1963. 3. On the family Phyllocladaceae in Taiwania 18: 142-145. 1973. 4. The phylloclade of Phyllocladus and its possible bearing on the branch systems of progymnosperms in-Ann. Bot. n.s. 38: 757-764. 1974. 5. Phyllocladus and its bearing on the systematics of conifers. In K. Kubitzki, Flowering plants, evolution and classification of higher categories (Pl. Syst. Evol. Suppl. 1) pp. 235-252. Springer-Verlag: Wein & New York. 1977. 6. 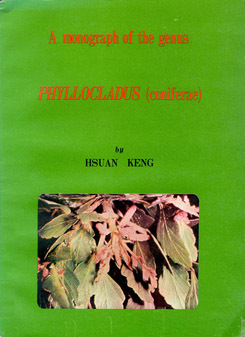 The genus Phyllocladus (Phyllocladaceae) in Jour. Arnold Arb. 59: 249-273. 1978. 7. The phylloclade of Phyllocladus and its possible bearing on the foliate organs of Coniferophytes. in Bot. Bull. Acad. Sin. 20: 9-17. 1979. 8. A new interpretation of the compound strobilar structures of cordaites and conifers in Reinwardtia 9: 1979, in print. 9. Aspects of morphology of Amentotaxus formosanus with a note on the taxonomic position of the genus in Jour. Arnold Arb. 50: 432-446. 1969. 10. A new scheme of clasification of the conifers in Taxon 24: 289-292. 1975. "I wish to take this opportunity to express my sincere appreciation to the publishers of the above periodicals their permission to reprint these articles, to Professor Dr. Tseng-Chieng Huang for his helpful suggestions and encouragement, and to Professor Tsai-I Yang for his unfailing attention and interest to the publication of this book."